I'll Have a Blue Christmas by Elvis Presley is my absolute favourite Christmas song ever! Perhaps that's why I've been a trifle obsessed with having a blue Christmas tree for the past few years? Either way, I finally got my wish! Et voila! 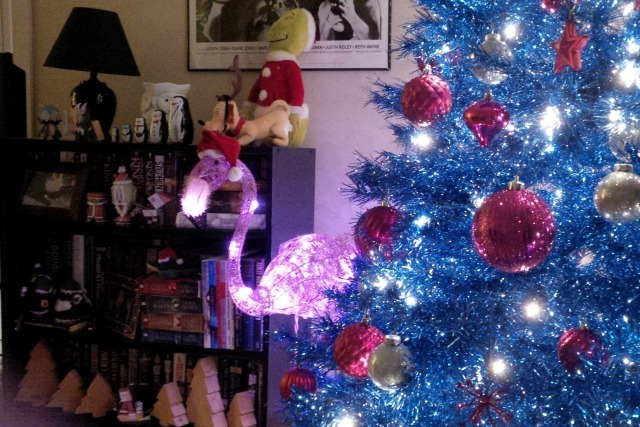 My blue Christmas tree...with hot pink decorations! Yay! 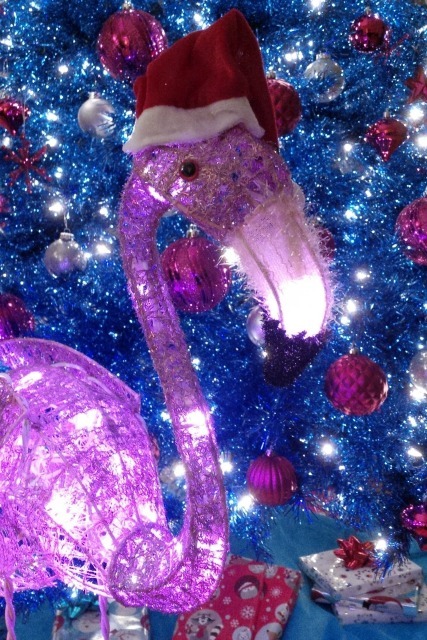 Floyd Flamingo approves of pink decorations. 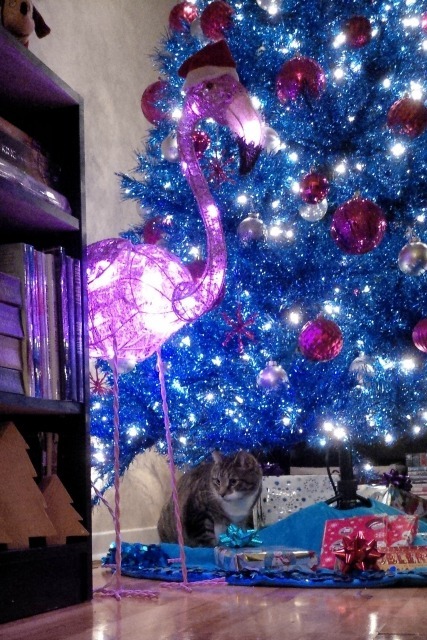 Oh, look underneath the tree. Spongeworm Stripeypants thinks he's being stealthy! Wormy approves of the tree. He says it's good eatin'. Let's zoom in on that striped cutie, shall we? 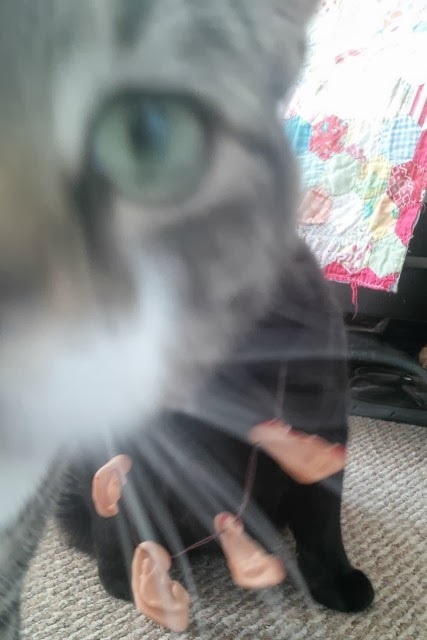 Hmm, kind of fuzzy...but then again, so is he. And one more shot of the tree, from another angle. Because why not. Ah, December. Tis the season to be jolly, fa la la la la, la la la la. 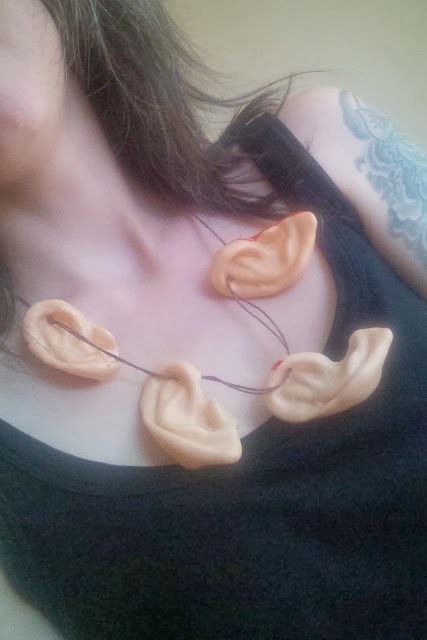 Also, decorations! Here's a sneak peek at mine. 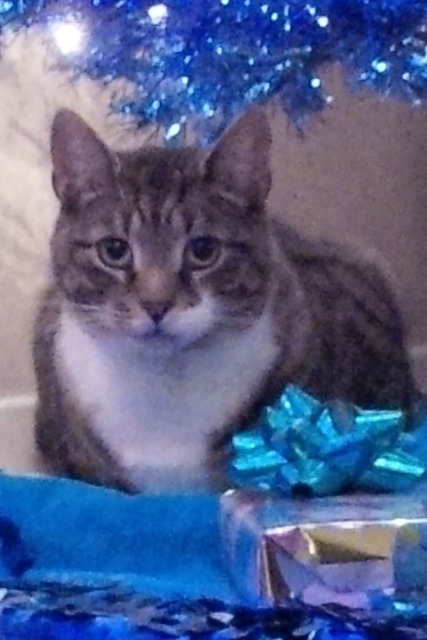 First up, the Christmas Creature! (From the Black Lagoon, of course.) 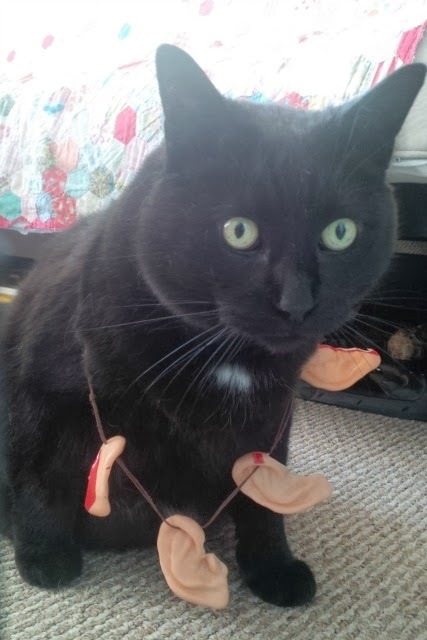 He makes a nifty ornament holder. Look how happy he is! 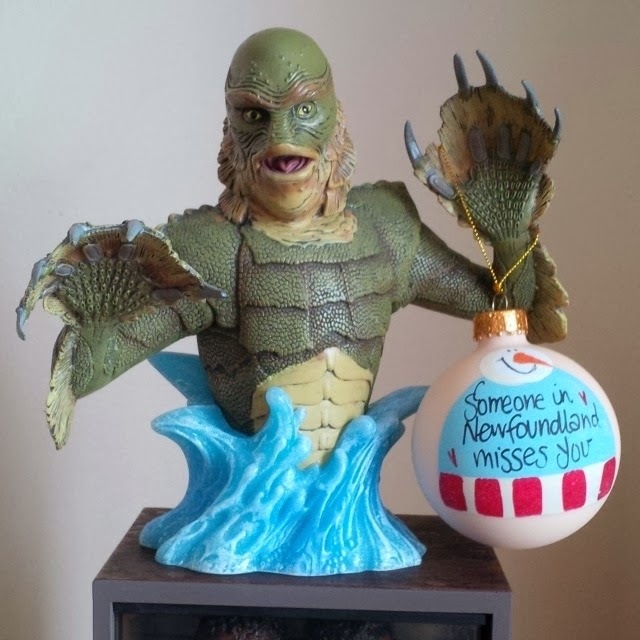 The ornament was part of last year's Christmas gift from my Aunt Madonna. 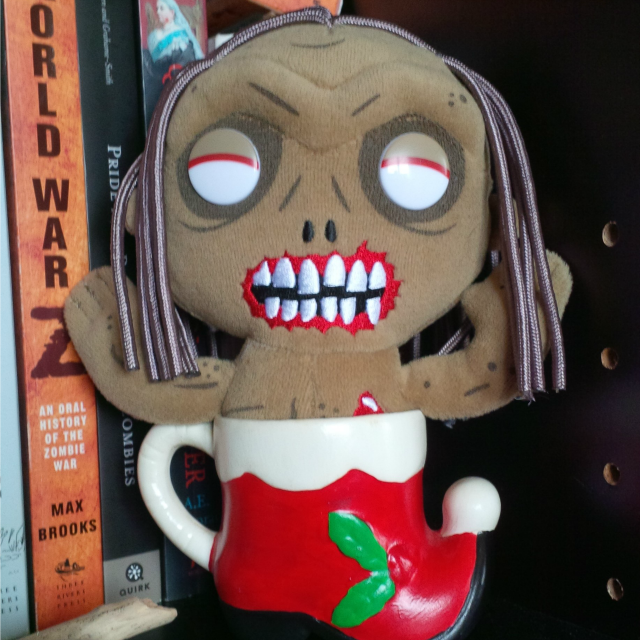 Here's plush Bicycle Girl (from The Walking Dead), sporting a Christmassy Goomba's Shoe (of Mario Bros. fame). The shoe is hand painted ceramic, and was a Christmas present from the same Aunt Madonna when I was two years old. Both Bicycle Girl and The Creature were presents I bought for myself. I spoil me. Decorating with zombies in ceramic Christmas shoes is totally normal, right? Right. 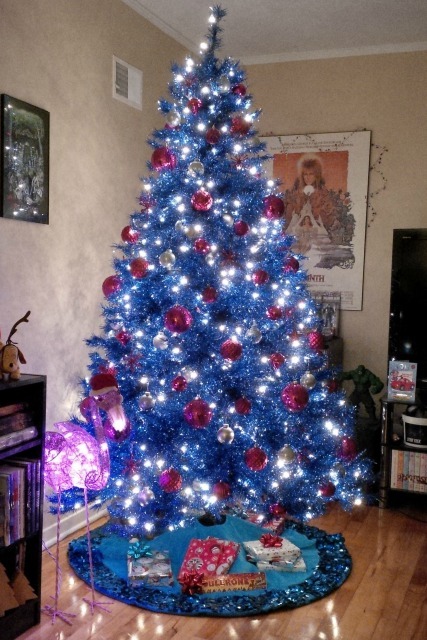 Next up: my awesome blue Christmas tree!